Many years ago I read a six volume set of books on WWII by Winston Churchill that I got from the public library. Churchill won the Nobel Prize in literature for his accomplishment. The six volume series was later condensed into four volumes. I decided to re-read the slightly condensed version of the series and just completed the first book called Milestones to Disaster. Churchill liked to call WWII “The Unnecessary War.” This first book in the series is his account of how, at many turns, through aggressive action either of political or military nature, World War II could have been avoided. He makes convincing arguments that England, France, the League of Nations and their leaders made many wrong decisions that played directly into Hitler’s plans. He names names and take no prisoners in respectfully identifying the political leaders, Baldwin, Chamberlain and others, who grossly erred in their leadership judgement and lead the world to the precipice of a war like no other. It is remarkable to consider how things might be different today if better leadership and decisions had emerged during those fateful events from 1930-1939. 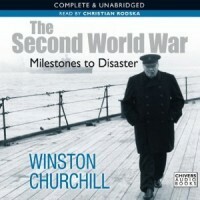 Churchill’s books represent an interesting perspective on history. He is the only world leader from this period to have written about the war. In that sense he is the most authoritative eye witness to describe this prewar period. He is also the only world leader to have been politically high-placed during both of the great wars. This unique window of position makes Churchill’s books absolute classics for understanding the political drama of the period leading up to WWII. However, Churchill’s writing has certain limitations. They cannot be viewed with the value provided by an objective historian. Churchill is writing of a time period in which he was a principle player in the political landscape. Some of have said that these books are more memoirs than history texts. Churchill mostly seems to stay away from personal vendettas but does make the occasional exception to that. He also does not have the information that modern historians like John Keegan have gained as top secret files from Russia became available in recent years. If you find this period of history interesting, Churchill’s memoirs are invaluable and fascinating. Churchill, with his word-smithing abilities, and his unique political position, his unique clarity on totalitarianism, describes beautifully the demands that came upon him, the leaders of his time and his country in one of history’s most perilous moments. NOTE: This post represents my personal reading and not the reading that I do on a weekly basis in preparation for Sunday teaching. My sermon reading is mostly theology books and commentaries and news posts that offer illustrative affect.